This workshop was on Saturday 29 July; the fourth of four linked sessions at Contact meets Contemporary 2017. The final session of the Contemporary Dance intensive; thoughts about learning; and the differences between contemporary dance and contact improvisation. We start with a warm-up: standing, our feet are anchored to the ground. We move our hips and our back; folding at the waist; going to ground; returning to stand. Trio One person – standing, puts a foot forward and offers their thigh as a bench to another who places both their hands on it for support, and stretches their leg out to be manipulated by the third person in the trio. We can guide the movement of the outstretched leg from the foot including the position of the pelvis; we can compress the leg and fold it at the knee; or rotate the leg from the heel; or pull and ‘stretch’ the leg. We are examining the possibilities; and the relation of the leg, hip and pelvis. Duet Working with one partner, our partner offers their thigh to create a bench – like in the previous exercise. This time, our intention is to balance on this bench with our shoulder at the intersection of the pelvis and thigh where there is a corner; and our legs up so we are inverted. Initially, we engage our shoulder at the pelvis and rock a few times to gain a feel for it. We need to uncurl our spine to become inverted, and lift our pelvis. It’s difficult, and when we’re inverted then our partner’s hands keep us stable – upside down! We learn the first part of the duet sequence and I continue learning Olivia’s part. 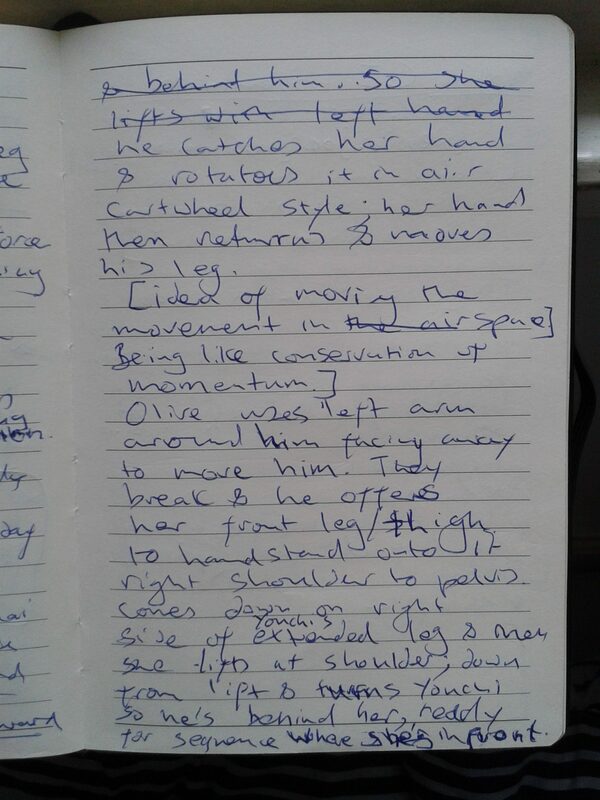 I kept written notes in a dance diary for the dance festival, and you can read my entry for the movements which we added to the choreographed duet below. See the writing to the right of my thumb in the photo: ‘we continue sequence but actually the first part of it (even though taught 3rd day of intensive) …’. 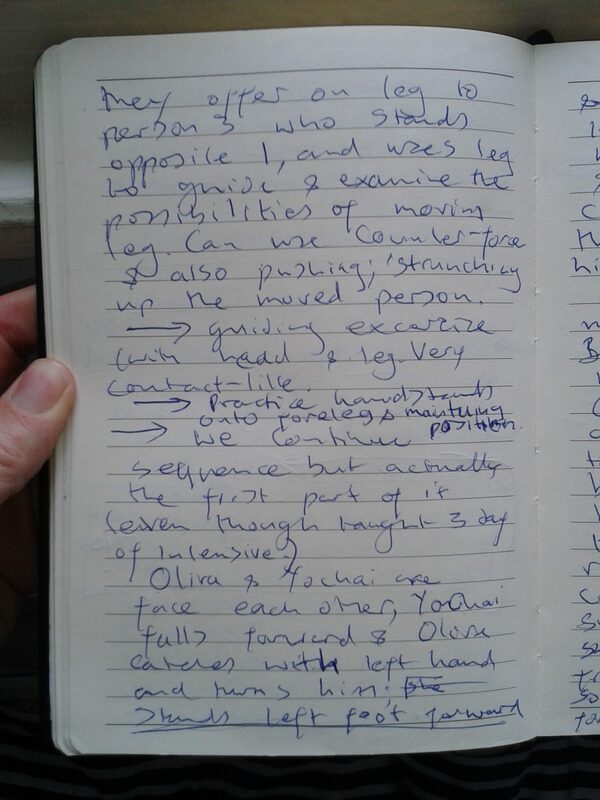 The next page of the dance diary is shown below with the remainder of the routine described. 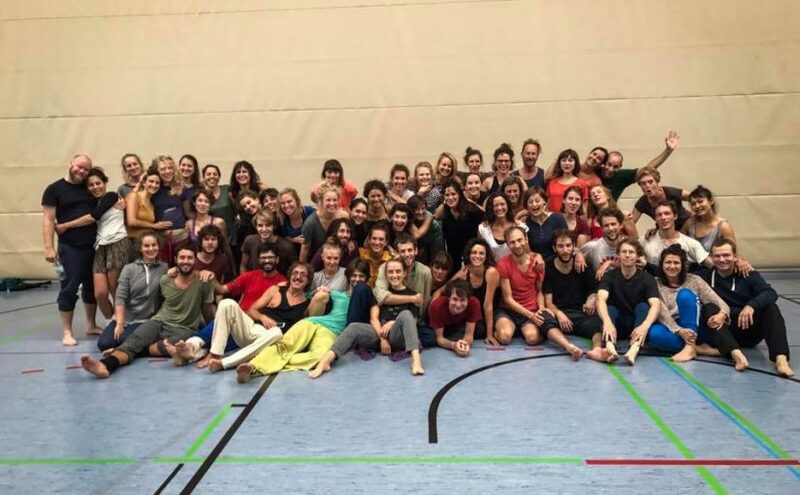 There were lots people in the Contemporary Dance intensive – as you can see from the group photo, and only two teachers: Olivia and Yochai. The sessions were successful but a lot of teaching was necessarily peer taught. For example, we might miss a particular part of the routine being shown to us by the teachers, and when trying to practice it with our our partner then we’d figure out between us as best we could. In the duet which we learned then there were contact like movements but also some movements which are unlikely to be seen outside of a choreographed routine. They simply aren’t part of the vocabulary of contact improvisations. Others movements or practices – using a hand to manipulate a partners foot and rotate their body for example – would be frowned upon. Indeed, when I tried this in a jam at Contact meets Contemporary then I was criticised by my dance partner – who’d not attended these Contemporary Dance sessions. In some sense, it’s easy to combine contemporary dance and contact improvisation: everything can be choreographed! However there are some real differences: the space in which contact improvisation works is very close to the body – the kinesphere (see note below). Yet, typically in contemporary dance it is the floor area or the stage area – which is the performance space. This isn’t something which we considered in these intensive sessions – we learned a choreographed routine with a partner; and we didn’t explore the performance space. There is another aspect of these workshops which I noticed. A number of times, we were ‘drawing with our feet in the air’ as Olivia said. In contact we might be drawing on the body of our partner but I’d never considered drawing in the air. Given that drawing in the air, changes our posture and balance (the fulcrum) even when in contact then maybe this is something to explore further.